I love this set ! Contemporary, beautiful and perfect for the guest room we have. This amazing comforter set combines the timeless design with super soft, high density micro fiber fabric to give you style and comfort in one big bundle. The clean lines and simple color combinations add a touch of chic. The plush fillings give this comforter set a luxurious look. Care instructions are: comforter is dry clean recommended; decorative pillows are spot clean only; shams and bed skirt are machine wash cold with like colors, temble dry low (please turn sham inside out before wash). I have been searching for this style comforter set for some time. It is really beautiful on my bed and the various pieces in the set highlight the look. The quality of the set is very good and looks extremely sharp on the bed. My only minor concern was that sitting in the plastic bag probably for a long period, areas of the comforter came out looking a bit creased. But a really lovely bedding set for a fairly reasonable price. Bedding is very soft and true to size! (King) Colors are very crisp. I’m going to dry clean the comforter as to preserve its colors and not risk bleeding. Overall, very happy with my purchase especially at this price point! 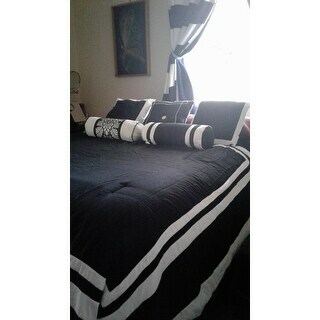 This comforter set is a great design and quality. The best comforter set I have ever bought. I had read on here that the comforter was really thin. 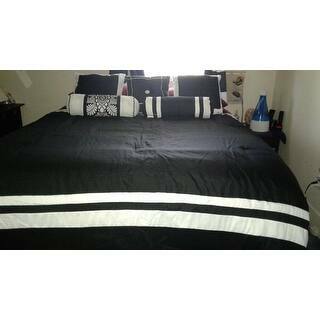 However, it's perfect for me because I'm not one for bulky bedding. It looks very nice as well. Product has low quality fabric with poor workmanship....What else do I need to say? I love the quality of my new comforter and new sheets as well. I have bought alot of new quality stuff for my new apartment and is still buying items. Not what I expected overall. The decorative pillows that came with the set seemed worn out to me but the comforter itself is very thick and I love that. Item was cheaply made. Fabric very thin, threads everywhere. I purchased the gray and white. Very pleases with its simplicity. The inter cotton stuffed in the lining isn't quite distributed throughout but overall it gives the look "hotel-look." I just wish it was crafted a little better. I purchased the Hotel Capprice Comforter Set for a guest bedroom, and it did not disappoint the space. It provides a modern and contemporary feel that allows the bed and bedding to provide a fresh look the minute that you enter the bedroom. I recommend the purchase. It’s beautiful and quite the bargain. My bedroom is refreshed and perky! "what does the underside of the comfortoer look like? Is it a solid black or white, OR is the inverted version of the pattern on top?" It is solid white for all colors.